So you have yourself a wireless network and a printer. The printer is not wireless. The challenge is that you would like to print over the wireless network from any computer connected to your network either wired or wirelessly. How do do it? The answer is quite simple and the logic behind it is quite sound. 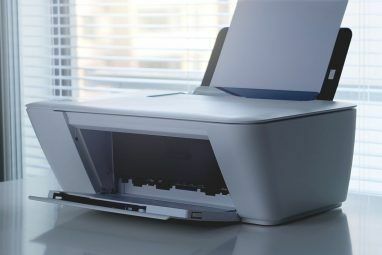 No matter what the make or model the printer is, you can simply send print jobs to it through the wireless network by connecting it to a computer that is always on and share the printer from that machine. I will be using good old Windows XP as the client and print server to show you how it works. It will be a little more complicated on Windows 7 or Vista but if you have your share permissions down, it should be easy. First things first. Make sure that you have the same username and password set up on the machine you want to use as your print server and the machine you are going to print from. This is required so that you can communicate with the other machine. Once you have the machines’ usernames and passwords synced up, you can turn to the machine with the printer attached to it. From this machine (which we will call the print server), we will need to set up the printer on it (if it is not already completed). Test that you can print and the output is what you expected. Then we will need to go to Printers and Faxes in the control panel. When you get to the properties page for the printer, you will want to click on the tab that says Sharing. Chances are sharing will be turned off like it is in the screenshot below. Simply click on the share this printer button. That will enable the box to type in the printer’s name. It will be grayed out until you click the radio button to share it. Now depending on what other operating systems that may connect to the print server, you might want to click the Additional drivers button to load up drivers for other operating systems besides Windows XP. Simply check off the system types you want to use and point it to the correct drivers. You may have to find the CD that came with the printer or go download them from the manufacture’s site. If you see this dialogue then you do not have the same password and username on both machines. Double click on the printers folder, then on the actual printer. It will install the drivers and you will be good to go and able to print from any application as long as the print server is on. To learn to share a printer over the Internet, check out an older post of mine How To Share A Printer Over The Internet How To Share A Printer Over The Internet Read More . 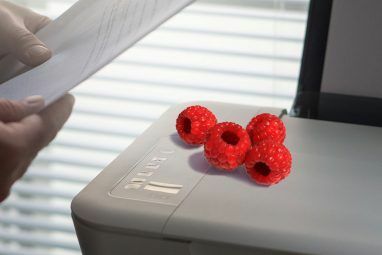 Did you expect a more technical way to share a printer wirelessly? 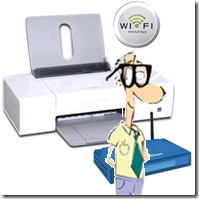 Would you modify your printer to enable printing over a wireless network? Tell us your solutions in the comments. good info, i like this article. Wanted to add, both computers are Macs--one's my MacBook and one's a 2005 iMac (one of the colored ones w/a CRT monitor). Has 9.5 gig HD running Panther. There must be a way to set this up w/Mac, using my laptop, my old iMac (in the basement) and my HP DeskJet (also in the basement). Would love to know how. Will tinker w/it myself and post results if no one else has figured it out. Wanted to add, my laptop is a MacBook. There is a way to do it with Macs, but if the other computer is a Mac also then I think all you have to do is go to the print/fax preferences and hit sharing then go to sharing (systems prefs) the hit share printer and if both computers are on the same network then go to the other one and go to the finder>go>connect to server and type the ip address and share printer. hope this helps! it did for me! Thanks! I'll try that & let you know the results! Well I guess your method would work, but you sure made it way more difficult than it needed to be. Start with your always on pc, with the printer installed. If you do not have file and print sharing enabled, run the Network Setup Wizard to turn it on. Right click the printer, choose sharing and share the printer. On any other pc in the house (wired or wireless) go to Printers and Faxes and click Add Printer. Choose Network Printer, and Browse. It should show the printer, you might have to click the name of the pc first. Click to make it the default printer. Print. It doesn't care what your user/pass is. No Run box, no network password. I've been doing this for lots of years, and I have never needed to use the same username and password in both computers. My trick is, if I've never shared a folder in the server computer, create a dummy folder in the desktop, go to its Properties' sharing tab, enable folder sharing and when it asks me what to do, I choose to only enable folder sharing (sorry, this only happens the first time, and I can't exactly remember what it says). And finally delete the dummy folder. This way the username/password dialog does not appear if you use different usernames in both computers. I don't know how our setup actually is, but here are the basics I know about (my father manage the network at home). We have one router out to the world. This is connected via some things to the printer. The router is also connected to our wireless router that send signal over the wireless network. We also have a document server, which don't use that much energy. A part of the network is turned off when we go to bed (printers and document server). The rest is left on because we have IP based phones. Can you show us this using Linux by any chance? Much easier (and cheaper) way to do this. use 2 wireless/wired routers - one with bridging capability. Plug your printer into the wireless router, which connects to your other wireless router. Then you don't have to leave a computer on all the time to make the printer available. which is a all-in-one printer ............. and it not have wi-fi. now how i am using it .. 2.) now to give a print from laptop or i-pad and mobile- first i have to connect my device to the same network by wi fi . then i can give print by my hp application. 2.)) so what i have laptop, tablet , mobile with WI-FI and hp application. no internet. SO JUST WANT PRINTER HAVE A WI-FI ... EXTERNAL ... SO THAT IT CAN BE DISCOVERABLE BY ANY DEVICE. but with a main line ON SAME NETWORK. so just adding a router to printer can make printer discoverable by wi-fi of other devices. simply i want direct printing ..
WHAT EXTERNAL DEVICES I HAVE TO BUY ??? To make this solution more energy-friendly, I'd suggest also using this always-on computer as your network-attached storage, and find any other uses that you can for it, e.g. BitTorrent downloads. Otherwise the machine is just sitting there 24/7 waiting for print jobs. My personal preference is to install a PDF print driver on all "client" machines and save the generated PDFs to a USB drive, to be printed in batch as I make time for it. I print very rarely, so this makes the most sense in my situation. This is great advice but the key point to remember is the computer connected to the printer must always be left on. Because of this, I bought a relatively inexpensive wireless all in one printer ($70). It takes the same kind of ink cartridges as the printer I already have, so instead of buying more ink for $50 for it, I spent another 20 bucks and just replaced the printer. I looked into wireless print servers for about $20, but they were incompatible with my current printer. Been doing this for years and it's very helpful. I can print from my laptop from anywhere in the house! The other option would be to go buy a wireless print server (if you don't have the always-on machine).